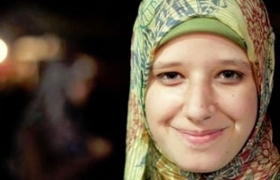 Muslim Brotherhood leader Mohamed al-Beltagy wrote a letter to his daughter Esmaa al-Beltagy killed on Wednesday by snipers at the sit-in at Rabaa al-Adawiya. I don’t bid adieu to you conversely I say “see you tomorrow”. You lived walking tall challenging the atrocity. Rejecting all obstacles you fall in love with freedom. You were looking for new horizons silently in order to resurrect and reconstruct the Ummah so that it can take the place it deserves within the course of civilization. You did not mess up with what your peers dealt with. Your thirst of learning and knowledge never ended although you were always the best at school. I saw you in a bridal gown in a dream two days before you were martyred. You were unprecedentedly beautiful. When you sat beside me I asked you “Is it your wedding tonight?” “My wedding will not be in the evening it will be at noon,” you responded. I understood what you had meant when I heard that you had been martyred on Wednesday noon. I prayed to Allah to accept you as a martyr. Your martyrdom reinforced our belief that we are on the right path and our enemies are in void. I am extremely sorry that I could not be with you on your last goodbye, I could not see you and kiss your forehead for the last time and have the honor of performing a funeral prayer for you. The thing that kept me from doing these was not the fear of death or dark cells; instead it was to sustain the cause you died for (the main targets of revolution). The ruthless bullets shoot you on chest while you were resisting the atrocity. What a great determination and satisfied soul you had. I believe that you were loyal to your promise to Allah and He is loyal to His promise to you. 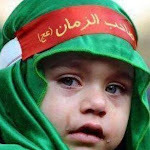 That is why instead of us Allah bestowed martyrdom to you. I don’t bid adieu to you conversely I say see you tomorrow … Our meeting will be on the banks of Kawsar Pool in Heavens with the Prophet and his companions; in a honorable position and close to the power and rule of Allah; a meeting when our hopes of having enough of each other forever."